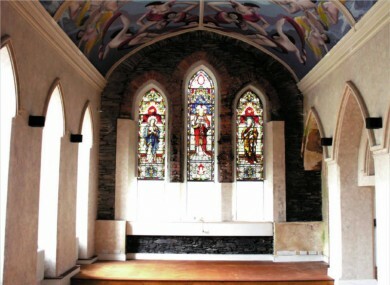 A chapel in the Kerry hotel up for sale. THE DEMISE OF the retail sector in post-boom Ireland is no more obvious than when looking at a brochure for the next distressed property auction. Due to take place in the Shelbourne Hotel on 15 May, the fire sale include two shopping centres, a number of stores, restaurants, pubs and a hotel. A total of 126 lots will go under the hammer in the Allsop Space auction, the latest in a series held by the company in Ireland since the economic bust five years ago. The most expensive property offered is an apartment block in Cavan with a reserve range of €1.5 million to €1.7 million. Twenty-four of the 60 apartments are subject to tenancies, 34 are vacant and two are subject to long leases. Ten units of a shopping centre in Dublin – which is anchored by Dunnes Stores – are being offered for less money as the Finglas West site is valued at €1.2 million. Another shopping centre unit in Kilkenny has a reserve range between €575,000 and €625,000. There are also a number of pubs on the list, including the Triple Crown in Limerick which is fully licensed and has adjoining accommodation. It has a reserve of €125,000. Brittas Bay pub and holiday accommodation McDaniels is also available in county Wicklow. The price? €625,00. The Watermarque Hotel and apartment complex on O’Connell Street in Cahersiveen comprises a two-storey hotel, leisure complex and chapel. The most extravagant lot is probably Ashroe House in Limerick, a detached period house with outbuildings, stables and a gate lodge on 51 acres of parkland. That will sell for at least €425,000. The last Allsop Space auction took place in March with 112 lots reaching or exceeding their reserve prices, including a Georgian building in Dublin for €640,000 and the Munster Rugby store in Cork City for €295,000. Email “Hotels, pubs and shopping centres up for sale in distressed auction”. Feedback on “Hotels, pubs and shopping centres up for sale in distressed auction”.